The Chadar Trek Journal – Julley! The Chadar! Sitting here in Bangalore, I am unable to find the right words which will make that trek come alive in front of your eyes. Pictures won’t do, videos won’t suffice. But this is an adventure that cannot go untold and uncelebrated. So then, where do I begin? Let me begin with the very beginning – what is this trek all about? In the high winter, a patch of the river Zanskar freezes to become a thick sheet of ice. The atmospheric water condenses on this ice to add another layer of snow. This blanket of frozen water is called the Chadar. For Ladakhis, walking over the Chadar is the only way of reaching Leh in Winter. For adventurists like us, it is another challenge to take on and conquer. With that in mind, on the 21st of January 2013, we, a group of 16, started from Leh to begin our 6 day 70 km trek from Chilling to Naerek. You must credit us for leaving Leh, for by doing that, we were also leaving behind the prospect of warm rooms, cozy blankets, hot water baths, and a lot of other things we will come to realise only during the trek. 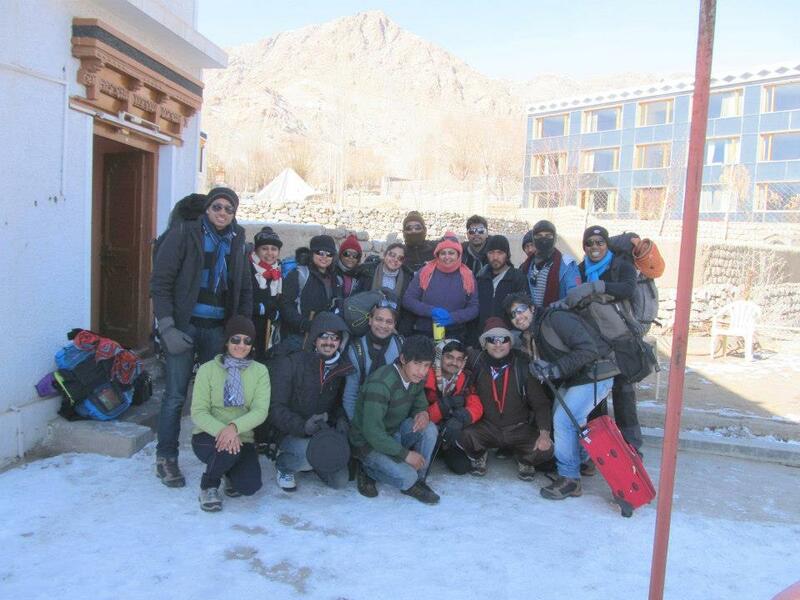 Our team, provided to us by Mr. Dorjay, had tried their best to make our lives comfortable during the trek though. There were 2 cooks, 4 helpers, 24 porters (to carry the tents, sleeping bags, mattresses and the food and fuel supplies). And there was Namjial, aka Gyanji, our guide through the Valley. From Bangalore, led by Sherpa Utkarsh and Dr. Ruchi, there were 16 of us – and shortly, you would get to know all our names. 11 Responses to "The Chadar Trek Journal – Julley!" I’m planning on this one too. Have you already booked for this? Who is the organizer? Chadar is a different experience which can hardly be put to words. Congrats to you for doing it and experiencing the magic! I am excited about my turn coming Feb ! !